Our Trainee Handbook is relevant to all our trainees and can be downloaded by clicking here. Each Campus has their own especific enrolmentprocedure and this is the Melbourne one which can be found by clicking here. A generic version of our training contract is available by clicking here and is also a part of our Trainee Handbook above. Psychodrama Australia Campuses are accredited by the Australian and Aotearoa New Zeand PSychodrama Association (AANZPA) and follow the AANZPA Code of Ethics. This code can be found at the AANZPA website by clicking here or downlode them immediately by clicking here: Ethics. The complaints procedure for the Psychodrama Asutralia Campuses can be found by clicking here: Complaints. This procedure can also be found in the Trainee Handbook. Psychodrama training can be undertaken in a variety of ways and these can be discussed with the Director of Training at your local campus. The following document gives an overview of the training if one was to undertake the training over a four year period: Curiculum overview. As you read our website, questions may arise for you as to the suitability of the on-going training or particular training events. Should this occur please feel free to contact the local campus through our contact form, which can be found by clicking here. A deposit is often required for the longer programs upon enrolment and this amount is specified in the event details for each workshop or workshop series. The balance of the fee is due by the beginning of the program. An alternate payment plan can be arranged if necessary and can be organised through the Campus Director of Training who can be contacted through the contact form by clicking here. Participants withdrawing from the year long programs before the end of Semester I are liable for the full semester fee and those withdrawing after the commencement of Semester II are required to pay the full annual fee, except in exceptionsal circumstances. Psychodrama Australia is registered as a not-for-profit company, limited by guarantee, with the Australian Securities and Investment Commission (ASIC). 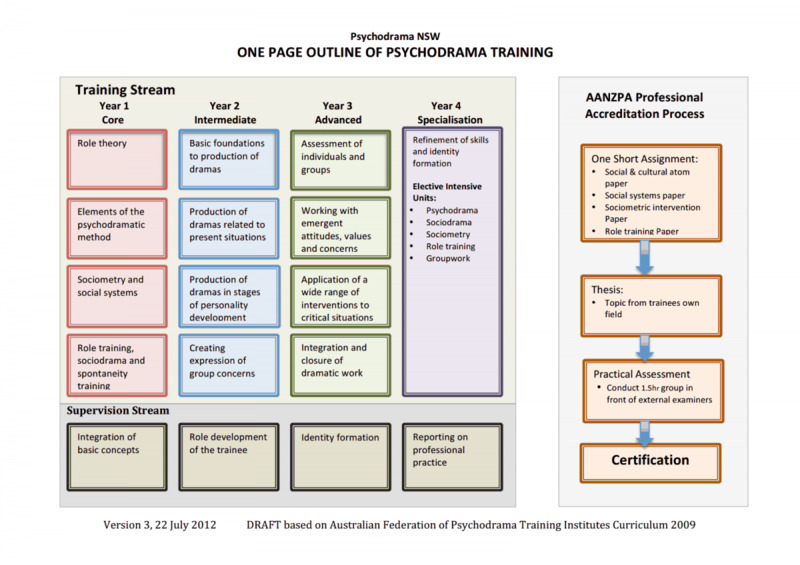 The members of Psychodrama Australia are the qualified trainers on staff at AANZPA accredited training campuses (formerly training institutes) in Australia. The membership is collectively responsible for Psychodrama Australia. The board of directors meet annually at a AGM, at which directors and office holders will be appointed and working parties report back and plan ahead. Psychodrama Australia conducts psychodrama training in campuses across Australia, with each campus having a Campus Director of Training and qualified training staff and that operate in a way which meets AANZPA standards for training institutes. For further information on the structure of Psychodrama Australia Ltd please contact your local the Campus Director of Training who can be contacted through the contact form by clicking here or Contact the Executive Director who can be contacted on the same form.